An ermine skirt is quite a grand and opulent way to stay warm in Winter. "P.S. Dare you wear it to a Junior League lunch with your mother..."
... She opened the box with a startled "Oh my God!" ... The coat spilled out into the light. Russian lynx, fashioned from pure white bellies, which were speckled with subtle black markings like dry leaves fallen on an early snow. Junior League? The Saudi oil minister's concubine would have blushed to wear it to Nell's. Tropes all about the many ways people can show off wealth, just to make things nicer for themselves. These can be used just because the people want to show off their wealth, or because it's socially required of them to spend their money that way. Such tropes can be functional (like a mansion for shelter, limo for travel, or fur coat in cold weather), or strictly sybaritic (like wearing lots of jewelry, gold-plating items, or wearing a fur coat in warm weather). Note some tropes here are not strictly for the most wealthy. Even middle class people can afford the occasional luxury (which shows off the aggregate wealth in a culture as well). It's just that wealthy characters are more likely to have several of these instead of one or two, and of a much higher quality. When a regular limo isn't sybaritic enough. A castle that's impossibly big and expensive. A home that's big and expensive. A weapon which also serves as jewelry. The entire land is full of wealth and luxuries. Spending loads just to show off wealth. A garage that's far fancier than a garage needs to be. A home with awesome features. Buying the stuff needed to be a superhero. Using luxury items to buy forgiveness. For royalty and nobility who choose to wear their regalia everywhere. Using money to open any door. A very fancy, old fashioned bridal gown. The fashions they cover usually are luxuries more than everyday clothes. Characters who have absurdly unrealistic and uncountable amounts of wealth. Feathers are glamorous, even if just a plume or two. A fancy table covered with several pieces of cutlery for each guest. A hot maid in a skimpy dress. Showing that you can afford to wear fur even at the beach or pool. Anything made of, or decorated with, gold. Traditionally reserved for people who like to literally put their money where their mouth is. 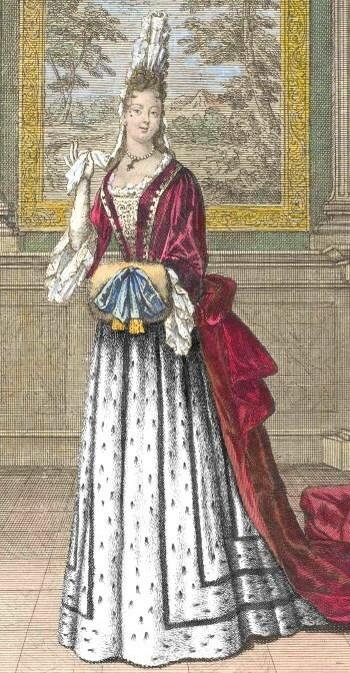 Fancy gloves often set apart the old money from new. Affording to do no real work at all. Luxurious lifestyle is told as casually drinking expensive alcohol. An island of privilege in an ordinary prison. A veritable army of maids. When money itself is the luxury. Tossing money into the air. When everyday comforts seem like an untold luxury to someone. It's a luxury to have such places treat you well. Almost anything can be a luxury to someone. Dress costing a lot due to all the trimmings. When gold doesn't cut it, amp it up with platinum. Rejoice among your fortune, literally. Fur garments are great to wear for warmth, or just for style. A private teacher all your own. A ruler reclines on something. A necessary luxury for royalty, but still a luxury. The use of white belongings as a signifier of wealth. Living a rich lifestyle that hides what you really do. Indicates the arrival or interior decoration of royalty, the rich, and the famous. Using money as a form of authority. Luxuries that are extravagant without appearing so. When a person is so familiar with fancy wines that he or she can expound upon the intricate flavor subtleties of all of them. A Cool Starship with an overly fancy design and numerous luxuries. A phone shows off money and modern technology. Incongruous luxuries indicate criminal activity. That one can afford both a long table, and a room big enough to hold it. The guy who's on the team to pay for everything. Lawn ornaments of the wealthy. Having people carry you around on a litter, sedan chair, etc. to show off status. Using an awesome vehicle to get around. When a starship (or boat) is much larger than it needs to be, often for ostentatious purposes. Appealing to consumers who spend the most. A fancy boat just to show one can afford it. Wine is treated as a luxury, or at least proof of being upper crust.